Other than price, some other reasons I decided on this knife was simply because it is a folding knife, which means less likely to injure myself while storing. (However, I am still considering a fixed blade for its ease of use, and lack of moving parts that are liable to break or malfunction.) I also decided on this knife because of its clip. I like a regular pocket knife, but I like the clip so that I can clip it to my pocket, still have it out-of-the-way, it is secure and I don’t have to fish it out of the bottom of my pocket which can be a hassle if there is other things inside my pocket. Size is another reason I chose this knife. While I like the size and weight options of the Jr better, in application, it is just a little small. The stainless steel handle of this knife is just over 4 inches long, and the blade is slightly over 3 inches. The knife fits well in my hand and feels comfortable. This is good in that I won’t have to be fiddling with it, trying to get the right grip when trying to use it, which could lead to problems. I also choose the fine edge over the serrated edge. I understand that the serrated edge allows it to be more functional in other ways, but the reason I chose to go with the fine edge is for sharpening purposes. I am not that handy with a knife, especially when it comes to sharpening. (I plan on learning though.) Also, my past experiences with serrated edges is that they break off pretty easily, and the knife ends up looking like a chew toy. Now, I can assume that this would have to do with both the material in which the blade is made as well as the conditions it is being used in. 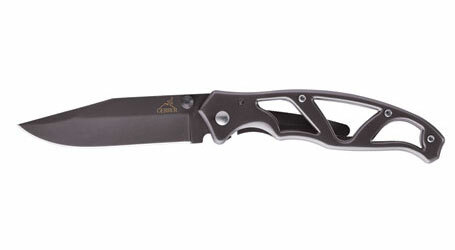 The Gerber Paraframe uses a high carbon stainless steel blade. And to be quite honest I am not sure how tough this steel is, or how well it will hold it’s edge, so I will be doing some more research on this, as well as paying close attention to the blade during its use. Probably the biggest reason I went with this knife over some of the others was weight. This knife is listed at 2.6 oz, and my scale says the same. The stainless steel handle is like a skeletal frame, which allows the knife to shave off ounces, yet still be sturdy enough to work. It also gives the knife an interesting overall appearance. So, far I have come to like the knife. There are a few things that I will keep an eye on, such as the clip. Clips seem to have a tendency to come loose over time, and require frequent tightening. Upon initial use of the knife the clip is quite sturdy, and tight. In fact it was so tight, it is rather hard to clip over the hem sewn on the pockets of blue jeans. It has over time loosened, but it is still tight. However, I will not complain too much over this. Just know that it was hard enough to require both hands to attach to the pocket at times. If the clip seems to become too loose over time I will simply remove the clip, reducing weight as well. Another thing I will watch is the actual locking mechanism. Upon opening the blade fully, the side wall of the actual handle springs over positioning itself behind the blade which serves as the actual lock. Again, the first couple of days, the lock was pretty tight, and the blade actually had to be opened with a good flick to be sure that the handle moved into place to securely lock the blade into place. Over the last few weeks the locking mechanism has seemed to break in so that it moves over much more easily. However, I will be sure to watch this closely. This is the bad part of a folding knife; I don’t want it closing over my hand while using it! The knife features a thumb stud on the blade to assist in easy-opening. Here again, maybe because the knife is new and needs broken in, but using the thumb stud to open the knife one-handed is nearly impossible for me. In my opinion, the stud is a little high up on the base of the blade, which doesn’t allow good levering action to properly (and easily) swing the blade open one-handed, using the thumb stud. (It can be done though, if I hold my mouth just right. :)) Seriously though, it has gotten a little easier since I bought it, by this I mean that I have accidentally accomplished it a few times. Anyway, I will watch this over time to see if it gets better (or maybe if I just learn how to do it). Don’t get me wrong on all of this though. I say that the knife is tight, but this is a good thing. Of course I don’t want the blade just falling open, so with this in mind, this knife is great so far. I don’t want it to loosen up too much over time, but just enough to be comfy. One important thing that I will be sure to watch for is the blade. How well will it hold an edge? Also, how well will the knife resist rust? Like I said, I need to read up on blades and what they can handle, and proper cleaning and the like, so I will also do my part and learn these things. Hopefully with the correct understanding, this knife will last a long time. One other thing. I tried using the back edge of the blade with my fire steel to light my White Box alcohol stove the other day. What I found is that it will work with the fire steel, but it took a few strikes before it produced any kind of spark. I am not sure how well this type of blade works for this type of application (which is why I will study up on it). After a few strikes, it did begin to make sparks, however, nothing near in comparison to the sparks made with the striker that came with the fire steel. In the end, I did get the stove lit using the knife blade and the fire steel, so at least I know it will work in the field. However, it may take a little more effort it was some form of tender that is not as easy to light as the highly flammable HEET. This entry was posted in Everything Else, Gear, Knives, Thru-Hike ~ 2013 and tagged alcohol stove, blade, fire steel, Gerber, HEET, high carbon stainless steel, Knife, locking blade, Paraframe, stainless steel, stove, White Box. Bookmark the permalink.